The penalty phase of the trial of Boston Marathon bomber Dzhokhar Tsarnaev has been suspended until Monday due to a sick juror. The jury was expected to hear more evidence Thursday to decide whether Tsarnaev should be sentenced to life in prison or the death penalty, and his family was expected to take the stand. Judge George O'Toole said around 10:30 a.m. that one of the jurors has a "temporary illness." Court was suspended for the day and isn't expected to resume until Monday. Five of Tsarnaev's relatives, who arrived in Boston from Russia last week, were expected to testify on Thursday. Prosecutors had pushed for the relatives to testify this week so they could be returned home on Friday. They said the expense of providing security for Tsarnaev's family members was proving to be costly. Tsarnaev's family will now stay in the Boston area over the weekend. They are expected to testify on Monday. Several of the family members were seen at the courthouse on Thursday wearing ankle bracelet monitors. Testimony on Wednesday was largely focused on Dzhokhar Tsarnaev as a child. His teachers testified that he was a hardworking boy with a bright future. Catheryn Charner-Laird, his third-grade teacher, said Tsarnaev was just learning English after moving to the U.S. from Russia in 2002 and cared very much about his school work. She said he "always wanted to do the right thing." Bomber's Teacher: He "Always Wanted to Do the Right Thing"
Other teachers said he got nearly all As in his classes, made friends easily and was an excellent soccer player. Tsarnaev was convicted earlier this month in the 2013 bombing that killed three people and injured more than 260. The same jury is now hearing evidence to decide whether he should be sentenced to life in prison or the death penalty. 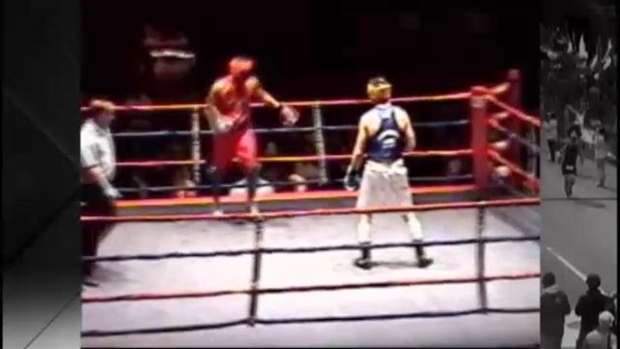 In a piece of evidence used in Boston Marathon bomber Dzhokhar Tsarnaev's death penalty trial, Tamerlan Tsarnaev is seen competing in a boxing match. Tsarnaev's lawyers on Wednesday shifted the focus away from his older brother, Tamerlan, who they have portrayed as the mastermind of the attack and a domineering influence on Dzhokhar. Rebecca Norris, one of Tsarnaev's teachers in seventh- and eighth-grade, said he was very bright and well-behaved. Massachusetts Institute of Technology dedicated a permanent memorial in honor of campus police Officer Sean Collier, who was slain by the Boston Marathon bombers. "He wasn't a rebel. Basically, if you asked him to do something, he would do it," she said. Norris said Tsarnaev was one of the school's best students and soccer players. "I thought we would get him into a really good college with a full ride, and he would be very successful," she said. The defense also showed the jury two photographs of a cherubic-looking Tsarnaev when he was about 9 years old. In one photo, he is sitting on a bench next to Tamerlan, who is about 16. Tamerlan has his arm around him, while Dzhokhar rests his arm on his older brother's leg. In the other, Dzhokhar is smiling with his mother, two sisters and the landlady who owned the Cambridge apartment building where they lived.